Sabal Harbour - Luxury Lakeside Villa 4BR/2BA. Built in December 2002, this fully-equipped villa, situated in a quiet secluded residential area, has everything for your comfort and enjoyment. The rear of the property, pool and lanai, is very private and peaceful and benefits from the sun late morning until evening. This beautiful, four-bedroom villa (two doubles and two twins) sleeps up to eight comfortably and the heated pool overlooks a picturesque lake. 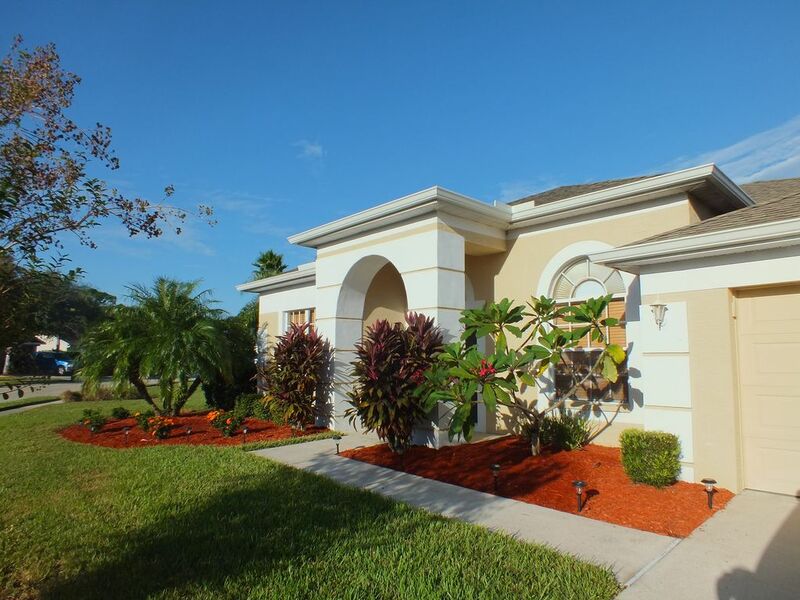 Located within easy reach of two golf courses, and for tennis players there are FREE courts within the Sabal Harbour community and a swimming pool/play area. Shopping malls and restaurants are close by. The beautiful Gulf Coast beaches are a short drive away, Tampa/Busch Gardens 45 minutes, and the attractions of Orlando/Disney 90 minutes. Bath and Pool towels provided. You will need to provide beach towels. Great stay in Florida. House is bigger in person and extremely clean and very well set up. The pool is gorgeous, sun all day and the pool heat was very warm and we could swim well into early evening (they don’t skimp on the heating setting!). The TV is huge and gets tons of channels. Lots of towels, beach toys/chairs, bikes etc very convenient. The only negative thing for us was that there was no child protective fence for pool, although I did not confirm this beforehand we just assumed there would be one in place, our fault for not confirming however with 3 small children and no high child locks on the 2 doors going to the pool it did pose an issue for us. Those with no small kids there would be no negatives at all, great house! Thank you Carly, pleased you had a great holiday and we really appreciate you taking the time to complete a review. Regarding the pool guard fence we do have one in the garage. You raised a good point though and we will check with future guests that have small children to see if they’d like it in place for their stay in our home. Our local agent can put it in place prior to their arrival date. We’d love to welcome you and your family back should your vacation plans bring you back to Florida again. Kind Regards, Mick, Lesley and John. We stayed at this lovely home for 2 weeks and did not want to leave. The home was exceptional. You could tell it was well cared for and I would highly recommend it. It was spacious, comfortable and clean. The layout was good with master on one side and other bedrooms on other side. The pool is warm and you can see many birds with the lake in the back yard. It's convenient to beaches, groceries, Wal Mart and Lazy Lobster restaurant is minutes away. Owners responded quickly to questions. We will definitely rent this home again without hesitation. Stayed in Sabal Harbour for 3 weeks duing the holidays 2018/2019 with my family and grandson, 7 persons. All in all very good, the house is perfect for this family size and all accessories for the youngest one, one year old. The location super, average short to main shoping centers, golf and beaches. The comunity was super, pool, basketball and tennis. Lively naigbourhood and friendly with lot of christmas lights. The main road is uder construction but it was OK and geting closer to be finished. I'm visiting Florida regulary and for sure, ready to rent this villa again. Thanks for us. Ingvar and family. Thank you for completing your review, we really appreciate you taking the time to do this. We are pleased that you and your family enjoyed your stay in our home and look forward to welcoming you back should your travel plans bring you to Florida's west coast again in the future. Hallo zusammen, wir können das Haus nur empfehlen, waren jetzt bereits zum 4x dort.. Sehr gepflegt und sauber. Golfplätze reichlich in der Umgebung. Das Viertel um Bookelia Cr. ist sehr ruhig gelegen am See. Einkaufsmöglichkeiten sind innerhalb von 5 min entfernt. Riesiges Outlet Center in Ellenton an der 75 nur 15 min entfernt. Please read our booking terms and conditions at www.villagulfcoast.com/booking. This also includes our own cancellation policy which applies to all bookings received. (please ignore the vrbo cancellation policy) Our home also contains a very useful information booklet and guests are advised to read this. Our rental deposit is $300 per week booked.